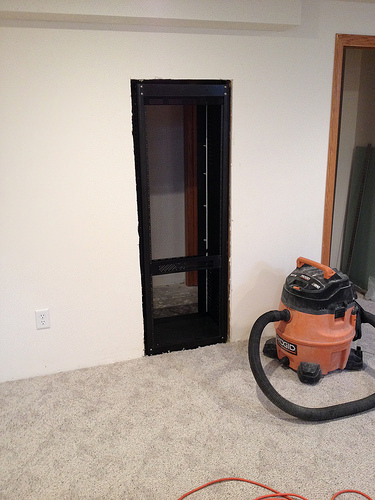 We finally were able to begin some work on the theater room today. As the old song goes “the First Cut Is The Deepest”, and that certainly was literally true on this project. My plan calls for opening up the wall underneath the stair case to set the rack in to the wall between the closet and the main theater room. I had a buddy come by to help me do some of the work as this was my first time cutting Sheetrock and studs. I’m glad I didn’t tackle this completely on my own. 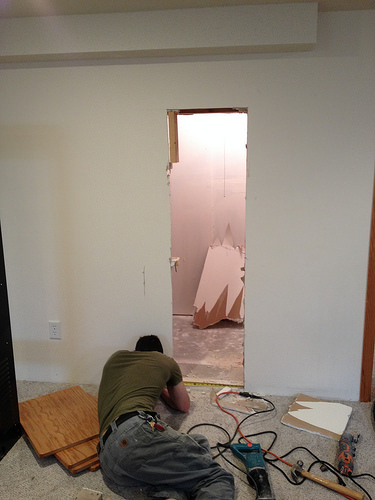 We hoped it would be as simple as removing one stud, and cutting the footer. However, we quickly found the entire wall was kinda pieced together using construction remnants and it would not be that simple. Once the space was opened up we double checked to make sure the rack would fit in the opening with 1/2 inch drywall being framed around it. The fit looks good. The wall although not load bearing itself was very deep due to a floor joist above it. 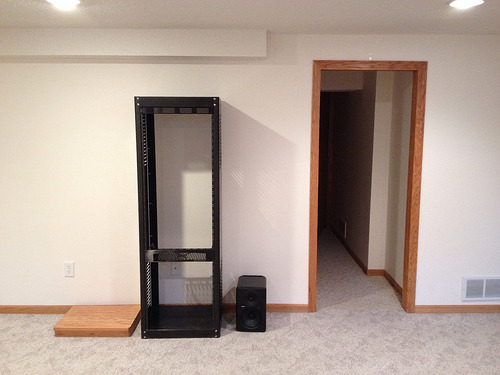 This is great news because the rack only takes up a small amount of closet space as a result. Things will be pretty rough looking until we re-frame around the backside of the rack in the closet. From there some drywall, corner bead, and mud and it should begin to look pretty clean again. The next challenge will be providing adequate electrical power to the rack. Currently my AC power needs at the rack are not that high. I do not have any large audio amplifiers in this installation. In time that may change and having a dedicated breaker installed in preparation for that would be prudent. Also, I would eventually like to install an uninterruptable power supply in the rack that utilizes a battery backup. From there an an in-wall rated Romex electrical line will run to the projector location. This will allow the projector to power down properly utilizing the batter backup in the event of an electrical outage. One unusual requirement for my installation is that the wall will also need an electrical outlet installed at roughly head level and to the right of the rack in the theater room. That outlet will provide power for the powered speaker used as a rear surround speaker. Most folks do not use self powered or amplified speakers. I would love to rock up the wall and finish everything off quickly but really that will all have to wait till some more power and low voltage wiring is wrapped up. Theater Room Construction to Begin! As some of you may know, my wife and I closed on our first home at the end of last month. Unfortunately, home ownership has a way of sucking up all your free time, and as such the blogging has continued to remain on the back burner. One of the main selling points of this home was the basement layout, which will make an excellent theater/media room space. As I eluded to in an earlier posting, most new modest homes in my area are built with a split level entry design. Usually this means coming in the front door, heading up five stairs for the kitchen, bedrooms etc, and going down some stairs for a daylight walkout basement. My wife wasn’t too keen on taking groceries up stairs, and I wasn’t too keen on the challenges of building a theater room around a daylight walk out basement. I wanted something easier to convert in to a true cave. Our house was built in 1960 and has it right for us, a mud room and kitchen the same level as the garage, and a monstrous basement. The main basement room is roughly 14 feet wide by 32 feet deep. One draw back is the low ceilings of only 7 feet 2 inches. I would have loved to have built a soffit around the upper perimeter of the room, but I doubt that will work well with the low ceiling height. The room came sheet rocked and finished. This will create some hassle for pulling cable and wiring, but overall makes it more usable in the short term. The following pictures show a little of how the room will be layed out. The first line of black tape on the floor shows the location of the first row of seating comprising of an Ikea Kivik sectional sofa. Behind the first sectional sofa will be a second row of Kivik seating placed upon a seven inch riser. 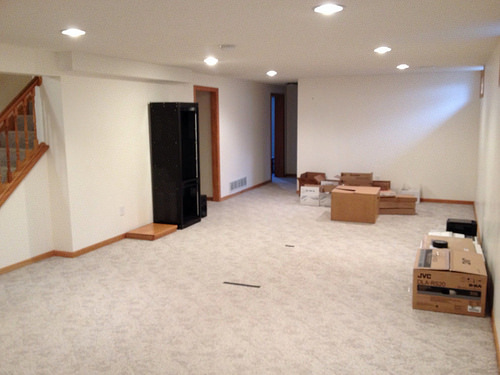 Beyond that, there may be space to do a counter with bar stools at the far rear of the room. The following picture shows the rough location of the equipment rack. The plan is to actually set the rack in to the wall. 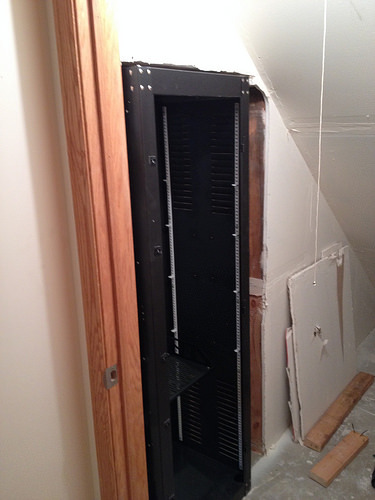 The rear side of the components and cabling will be accessible from the back of the rack from inside the closet under the stairway. The screen itself will be a 140 inch 2.35:1 aspect ratio CinemaScope ultra wide format screen placed where the line of black gaffers tape is located. The screen itself is essentially made an acoustically transparent fabric.The speakers and subs will sit in an alcove behind the screen and remain completely hidden from view during normal viewing. The first step will be to open the wall for the rack and then get it sheet-rocked and trimmed nicely. Then we can begin pulling cable to the various locations needed for speakers as well as the projector. I expect progress will be pretty slow over the next couple months. With the acoustically transparent screen possibly on hold until tax return time next year. However, I will be posting pics of most of the work taking place throughout the entire process. Thanks for reading, hope to have more posts soon. So during my blogging hiatus, the recent Consumer Electronics Show has come and gone. Admittedly, I was hoping for a lot more than what was shown. I feel like CES is far less cutting edge than in the past. It is not like the Detroit Auto Show where you come away socks knocked off by some concept car and some vastly different model line up. I’ll sum up my grief succinctly. Sony only introduced one other (pricey) 4K/UltraHD projector in addition to their 25 grand flagship model. No other manufacturers entered a true 4K/UltraHD model in to the market. Sony and Panasonic’s joint OLED venture folded leaving only Samsung and LG in the OLED game at this point. Every OLED display is still curved. In the great words of Mr. Horse… “I don’t like it, I don’t like it at all.” For me, it still looks gimmicky, with no real benefit outside of picture distortion depending on where you sit. No official announcement on any real new UltraHD physical content such as “4K Blu-ray” or any other next generation disc. Okay, so admittedly a few minor products did catch my attention. The first being DTS Headphone X. Think of it is as full surround sound with all of its speakers around you stuffed in to a pair of headphones. Now some naysayers may claim that is a direct attack on “the home theater experience” and just moves consumers to watching things on mobile devices. Fair enough. I’m on the road a lot, I have no choice in the matter some days, so I think that’s cool. Remember the now defunct Palm smartphones with WebOS? Well my wife had one, and actually loved the thing. It was a cool phone operating system, it was alarmingly simple and in my opinion it never reached its true potential. Palm was acquired by HP and they bungled the whole thing up to the tune of a billion dollar loss. Well, WebOS is back, and it is the new graphical user interface being used in some LG televisions. Very cool, some tweaks and from what I see I think it’s perfectly suited for that kind of function. 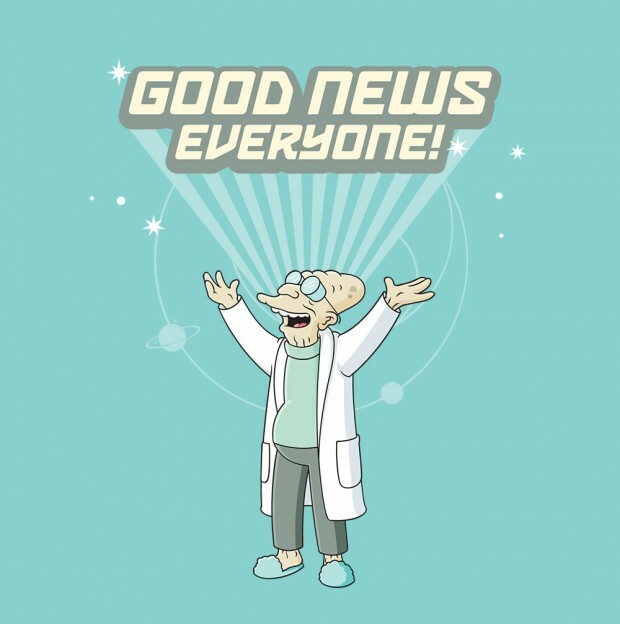 I have a Sony Blu-Ray player that I use to stream media and it’s user interface is lame, so this is very welcome news. Lastly, cable cutters rejoice! Channelmaster came out with a new over-the-air DVR. It has a really slick looking interface. 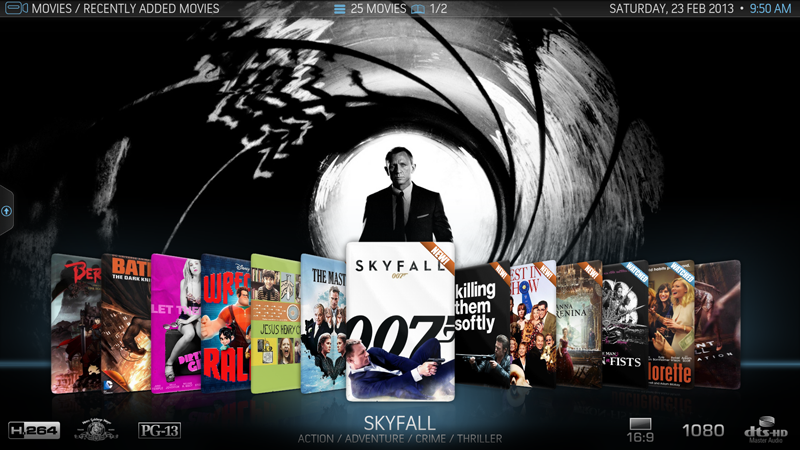 It currently can stream movies via the internet using VUDU. However, Channelmaster claims to be adding more services like Netflix, Hulu and Amazon prime at later dates. 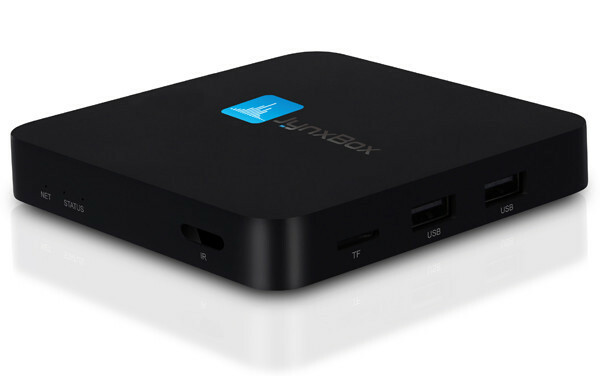 I guess it can also pair up with a Slingbox to stream your recorded shows to a mobile device while away from home! The downside is that it only can record two hours of programming on the box. As a result you need an external hard drive. That adds to the cost a bit but as someone with Channelmasters previous over the air DVR, I find this to be a plus. I run out of space constantly, and I find myself constantly choosing which programs I want to save and delete. A cheap 3TB external hard drive from some Amazon Gold Box deal and you could be recording 24/7 for days. So this could be a lemon you can make lemonade with so to speak. Check it out below. I do apologize for my hiatus. Work had me in training in January, and since then we have been working on a home purchase. Hopefully, this will lead to some “theater build” blog posts in the coming months. I’m really excited for that. Stay tuned. So, my next big purchase will most likely be a subwoofer. As such I recently found myself surfing the SVS Sound website, and noticed their Merlin subwoofer selection tool. 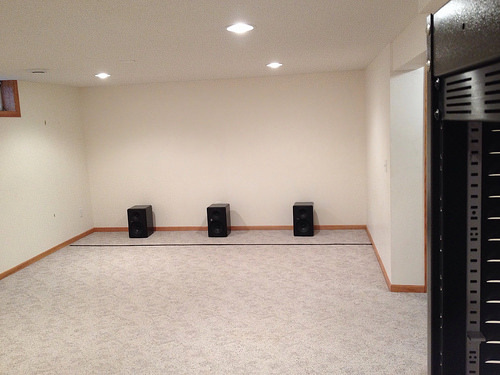 You start off by selecting the type of speakers you own. “HA! There is no way you guys have my speakers stuffed in your website…” I think to myself. To my amazement they did! I actually use self powered “studio monitors” from Mackie; often overlooked in the home market. So here is to you SVS Sound, I tip my hat to you. If you put in as much thought in to your products as you do your website than I’m sure you have a winner as far as my next subwoofer choice is concerned! What If I Told You My Plasma Owns your LED TV? So here is a topic that will bring tech nerds nearly to punches! LCD/LED or Plasma? So hold on while I get my mouth guard out. This discussion often results in differing opinions even when talking to my installer friends! Like most things I blog on, the answer is never black and white. Both have advantages and disadvantages, and the market is always changing. Right off the bat, I’m going to come clean and tell ya right now that I prefer plasma. The reason mainly being is that plasma is an emissive display technology, versus a transmissive display technology like LCD/LED. This means that with plasma, the pixel itself is generating the light (your old tube TV did this as well). On the other hand LCD requires some kind of backlighting (often from a light emitting diode or “LED”) to produce an image. I won’t get in to all of the “why tech” here, but it results in better black levels, less motion blur, and better viewing angles. Plasma still holds a slight advantage for off-axis viewing angles. Although, new LED sets are far better than I think this picture gives credit. On the other hand plasmas tend to be “power hogs” compared to LCD. Although this has improved greatly over the years. LCD also has the advantage in that you can push the brightness way up. This is great for commercial spaces, sports, and daylight viewing. “Screen burn” is less of an issue for LCD. Early plasma’s were definitely more susceptible to having an image burned in either temporarily or permanently if left on in the same spot for an extended amount of time (although I have read this is greatly reduced now, paused images left overnight can supposedly be worked out… I don’t want to try that). One final note is that some of the modern LED displays are physically the thinnest and sleek designs around. Some of my friends have asked “well which is better for gaming?” Well that answer is actually trickier than I originally thought. My first response was LCD. I enjoy a lot of old 8 bit and 16 bit Nintendo games. I always worried about having my Zelda “life hearts” burned in to the screen of the upper corner on my plasma. That fear may be somewhat justified for my style of gaming. However, on modern games some may prefer the faster refresh rate inherent to plasma. With plasma you are also less likely to have have to deal with any kind of “smooth motion” feature, which in addition to looking horrible in my opinion, also can add some lag time to an LCD display. So if your a little stoked for plasma, well I have one bit of advice. Buy one now! Panasonic recently announced that they will be discontinuing plasma production after the first quarter of 2014. That just leaves Samsung and it is anyone’s guess how much longer they will stay in the game. You may be wondering “what about OLED?” First, don’t let the name confuse you as “OLED” is nothing like “LED” in the way we know it. With current LED, light emitting diodes are currently used to produce light behind a liquid crystal film. OLED is more like plasma but that instead of using a gas to produce the light that makes up the pixel it uses carbon (hence the “organic” part of the name). So OLED is a true emissive display technology, with the advantage of when the pixel goes to black it can completely turn off, resulting in near infinite contrast ratios, excellent black levels and shadow detail. OLED should be amazing but it is currently very expensive. This is in part due to the panel failure rate during manufacture. I once read that for every OLED set that comes off the assembly line, seven of them come out defective. That has to change for the price to drop, and it is happening slower than I think most manufacturers had hoped. So it is coming, but how soon is uncertain. Hopefully, Panasonic’s exit from Plasma production is a sign of a new focus on OLED manufacturing with lower prices. Is 4K ridiculous? Yup! … That’s Why it’s Cool! “4K”, and “Ultra HD” are terms that have been getting a lot of buzz lately. I for one find it a lot more exciting than 3D, and I know I’m not alone on thinking that. However, like 3D, I know that a lot of people have already completely wrote it off. Well, I’ll just start by saying that 4K isn’t for everyone, but I certainly think it is a positive step for anyone who cares about the quality of movies viewed at home. So let’s look past some of the marketing, and in to what it means for the typical person (or nerd in his man cave). Before we go any further, lets first take a look at what 4K actually is. In general “4K” is a term that applies to displays or content having a horizontal resolution of roughly 4000 pixels. In the past we often categorized displays by their vertical resolution. For instance a typical 1920×1080 resolution display would be called 1080p. So in this case, 4K being 4096×2160 could also be referred to as 2160p. So why not just call it 2160p? Well to answer that, let’s take a small (ok, a rather long) nerdy detour in to what is happening at your local cineplex. Movie theaters began converting from film to digital projection several years ago now, and the standard they use is slightly different than what we have as consumers. Most movie theaters have 2K projectors with a resolution of 2048×1080. Wait! So the movie theater is projecting something that has only 6% more resolution than the 1920×1080 projector in my basement? Yup! It is just slightly wider than what is in your living room. The difference is in the aspect ratio, which is actually near 17:9, vs the 16:9 display in your home. 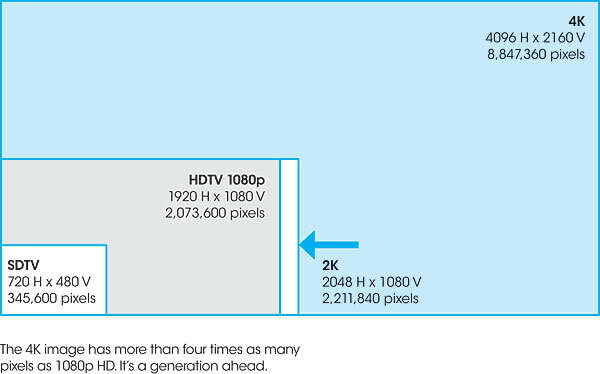 And as such, industry professionals call it “2K” to differentiate it from the 1080p resolution found at home. So how does this pertain to 4K? Well someone (over at Sony) got this great idea that maybe we can market the extra 6% resolution found in cinemas and sell it to consumers. “True 4K” sounds a lot cooler than 2160p, and you will have the same resolution in your home that is found in the best movie theaters in the world. Well this actually creates some problems. If you take a 1080p picture found on a Blu-Ray, you can’t just digitally blow it up by a factor of four and have it work perfectly for that 4096×2160 resolution; you also have to account for how to fill that extra 6% of screen width. Do you cut it off? Do you do some weird stretch to fill that space, that also introduces scaling artifacts? 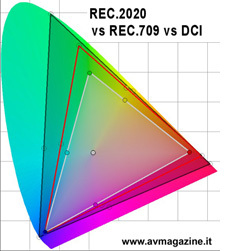 Eventually, some industry folks came together and said “maybe we should just make the consumer version slightly narrower again with a resolution of 3840×2160?” So that is exactly what they did, and now we call that 3840×2160 resolution “Ultra HD” or “UHD”. So, technically Ultra HD, is not 4k, but the term stuck (with Sony and most of the web); and now it just muddies up what we are really talking about in the end. Maybe you’re thinking “Holy Crap! That is still cool? I must have it… throw out everything!” Well, all I have to say to that is “Whoa there Mr. Magoo! How good is your vision?” Seriously, there is a limit to the benefit of this stuff. Ask yourself, how big is your screen and how close do you sit to it? A 42 inch 4k television at a distance of ten feet away would be stupid. 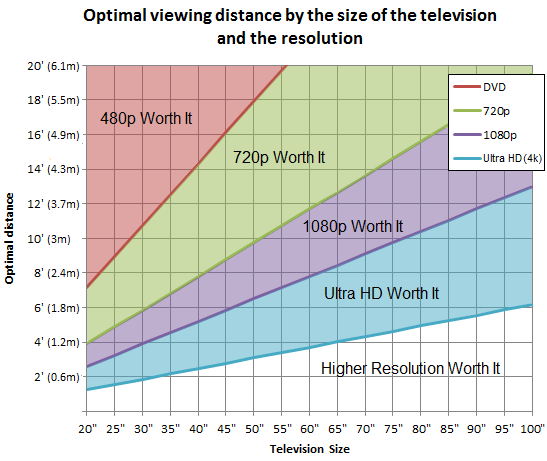 Generally speaking, if you sit more than 10 feet away from your TV, and your display isn’t bigger than 50 inches diagonally, then you won’t be able to tell the difference between 720p and 1080p, let alone 4K. Honestly, it makes sense for really big screens (I’m talking bigger than 70 inches, and move your couch closer while your at it); as well as computer monitors where you sit a foot from the screen. I know that my local 18 screen movie theater only has three 4K projectors on the three largest screens! Check out this graph below for a better idea. The other benefit lies in better future media content designed for 4K televisions. As the world moves more to streaming media, most folks will find it increasingly difficult to stream anything of high enough quality to really utilize the displays full potential. The required bandwidth is much greater than 1080p. As such, the studios and networks will have to either produce better quality digital downloads using better compression; or hopefully put some additional pressure on internet service providers to invest in faster internet infrastructure. Both would be a positive in my book. The Blu-Ray Disc Association is already discussing the technical aspects of the implementation of 4K Blu-Ray discs. Personally, I don’t see this as becoming anything more than a niche’ product. You probably will not see more than a handful of older movies re-released in 4K, due to the high cost of re-scanning and the mastering process needed by the studios. Think Lawrence of Arabia, the Wizard of Oz and then newer movies originally shot in 4K like Skyfall. Regardless of what television you own, an increased focus on video quality by the networks and studios can only be a positive thing for the consumer. A while back, I had the opportunity to watch some 4K content off of a server on a home theater projector that cost nearly $25K. It was great, I could literally put my nose up to a 130 inch screen and I couldn’t make out a single pixel.Then again, was it 25 grand great? Heavens no! Would I love to have a 4K projector for myself in time. Undoubtedly yes, but more importantly, if it ushers in better quality content at the same time then I’m all for it. So you want a “Movie Jukebox” huh? Hey everyone! I apologize for the hiatus. Things got crazy around here with visiting friends from out of state. Then last week I found myself stuck in a hotel room for two whole nights without working wifi. So, my blogging opportunity was dashed there! In my last post I discussed how I felt streaming media had a long way to go to really offer the same experience as physical media; and how the best of both worlds would be a kind of media server or movie “juke box” like the Kaleidoscape system. The Kaleidoscape has two big drawbacks, the primary being the high purchase cost, and the other is the need to verify ownership of the file being played by keeping your disc inside their carousel for verification. This really has me looking at two alternatives. 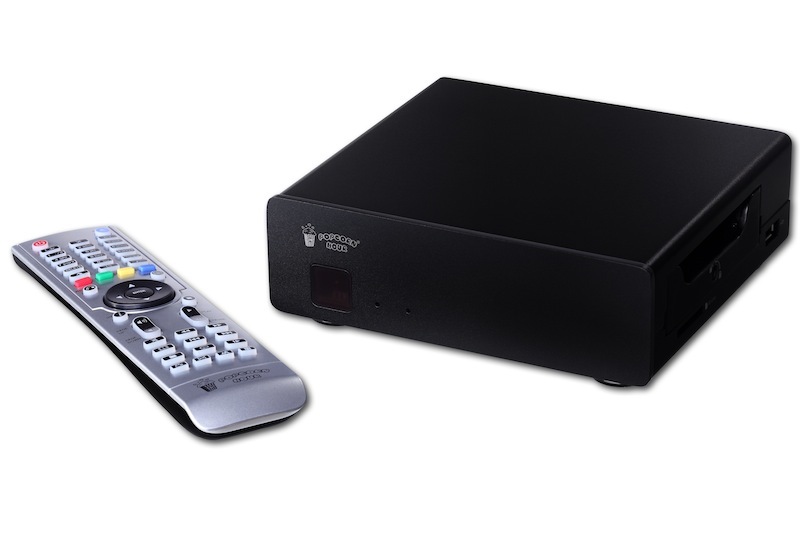 The first is a dedicated home theater personal computer or “HTPC”, and the second being a network attached storage device or “NAS” coupled with a separate smaller device near your display for playback. The HTPC idea has been around for several years now and during that time has gained a lot of popularity within the AV community, and for good reason! They do pretty much anything you ask of them and they are easily upgraded. The primary advantage of the HTPC is that everything involved in this system is handled by a single computer. The backup, the storage, and playback is all in one machine, and is arguably easier to manage as well. The downside is that the computer is usually tied to your primary display. You probably aren’t going to fire up this thing up to do your taxes; and as such the whole concept limits what you can do with the computer somewhat. So at this point you might be asking yourself “wait a minute, what box are you talking about putting by the t.v. to do this?”. Good question! I haven’t completely settled on the best one as of yet. Things are changing so fast that I have had a hard time figuring out which is the best value for my needs, but I’m going to throw a few up here that are on my “short list” of devices that may potentially work. Remember, that it must be easy to navigate, and be able to play high definition video that is stored on a hard drive attached to your home network. This is a tall order, and you won’t find this capability on an Apple TV, or a Roku box. The second option is a number of products from Dune HD. This company offers a slew of different models. The main differences seem to be the inclusion of an internal hard-drive and the ability to play back full Blu-Ray menus, rather than just the movie itself. Prices are a little steep compared to the competition but they appear to be a polished product with good company support. MSRP is around $299 to $359 for the models with full Blu-Ray menu support. http://dune-hd.com/eng . So there you have it. This stuff changes so quickly that I’m sure I will post a follow-up at a later time. Doing homework on all of these choices entails surfing forums usually dedicated to each company. Unfortunately, it seems like most people on said forums only have experience with a single product. I would love to get all three of them together to make a comparison, but at this point I would be happy to find another reviewer who has experience with even two different options.